Over our 29 years of experience in the moving industry, Adler Moving Systems has helped small and large businesses in Ontario, across Canada and across borders relocate quickly and efficiently. No matter what your office’s specific moving needs may be, the highly experienced team from Adler Moving Systems can help you achieve a total corporate relocation quickly and efficiently. For corporate moving throughout Ontario, across Canada and throughout the world, count on family owned and operated Adler Moving Systems! 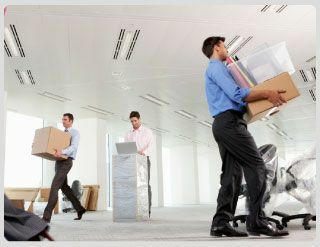 Contact us today to get a free estimate on your office’s move. Adler Moving Systems is proud to provide top-notch moving service to businesses in Sault Ste. Marie and throughout North America. Take a minute to browse a few testimonials from our satisfied customers below. I wanted you to know that all the things arrived in Olympia, Washington in excellent condition. We had no border problems. My niece was so impressed with how well everything was packed and the friendly persons who delivered it. We wanted to express our thanks for the smooth move. The operation was more like a cooperative family effort except for your staff’s professional expertise and punctuality. They showed us that moving isn’t always terrible! Please convey our thanks. Thank you very much for providing us with such a smooth, worry-free move. Everything seemed to follow plan and we were back in business at 8:30 on Monday morning. Our computers and furniture were all delivered to the correct spots, undamaged. Your team handled the move, which seemed like a daunting task to us, with such organization and ease.